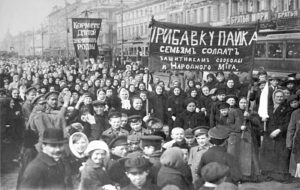 On February 23, 1917, female textile-workers and housewives protested a bread shortage in Petrograd, the imperial capital of the Russian Empire. It was the beginning of twelve days of protests, riots, and political dealing that concluded with the abdication of Tsar Nicholas II. This was the February Revolution. It was the beginning of the Russian Revolution, one of the most important historical events of the twentieth century, second only in consequence to the World War that midwifed its birth. Further along a lengthy chain of cause and effect from that bread protest in Petrograd, by the end of the year a Communist state had been established atop a 1/6th of the world’s territory; revolution after revolution, most momentously the Chinese Revolution, would follow the example of 1917; Fascism would in part arise as a reaction to it; and following 1945 it would for almost fifty years shape international politics. My guest today to explain the complex events of the first year of the revolution to us is Professor Richard L. Hernandez of the Department of History at East Carolina University. He is particularly interested in the social, cultural, and religious aspects of the Russian Revolution, particularly in rural areas. Currently he is completing a book tentatively entitled Political Religion and Religious Politics: Radical Modernity, Traditional Culture, and the Building of Socialism in Rural Russia.